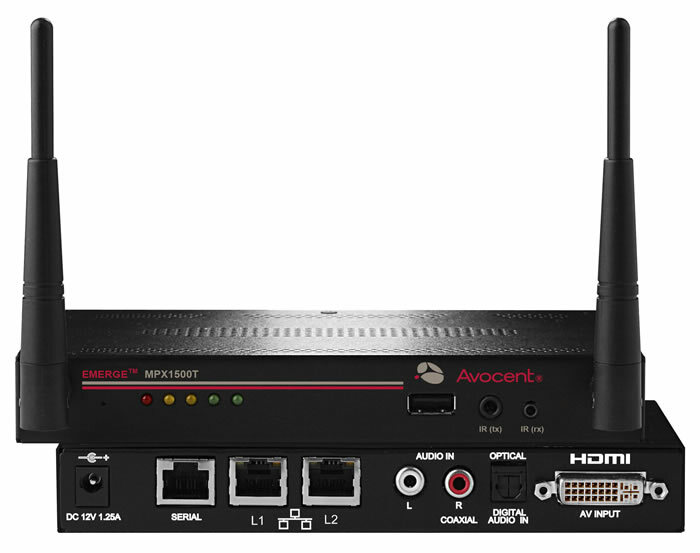 The Emerge® MPX1500 multipoint extender provides true digital picture and sound content delivery to displays for presentation and digital signage applications in a wired or wireless configuration from a source to one or more destinations. 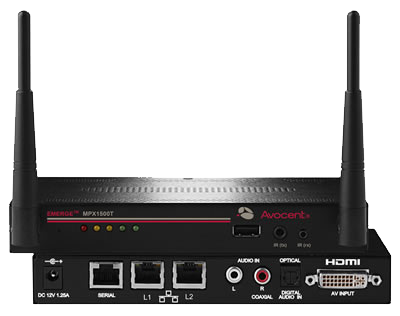 The Avocent Emerge MPX1500 multipoint extender provides wireless or wired connectivity for distribution of high-definition content from a source to one or up to eight destinations. Emerge MPX transmitters and receivers work in unison to form a managed audio video extension network able to deliver a synchronised stream of high-definition computer graphics or video and associated audio from a source to as many as eight display devices. Display device control information, content protection and interactive device control signals, including IR and serial are passed from source to sink through the extension network, providing a fully integrated solution. 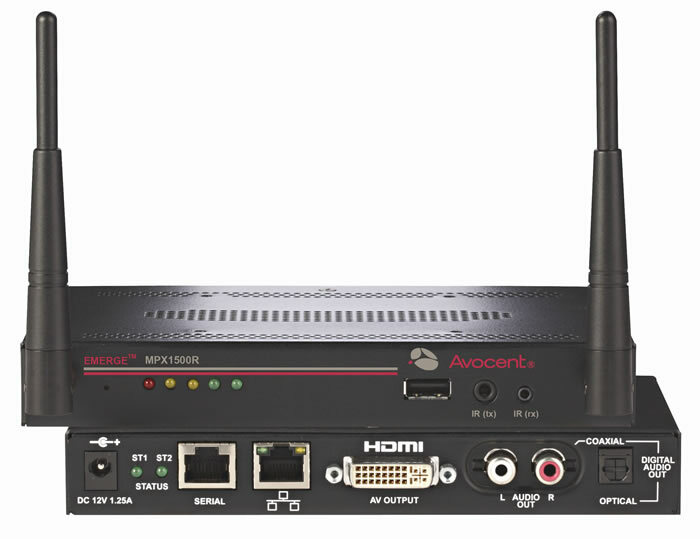 Ideal for professional high-definition media applications, the MPX1500 transmitter and receiver feature a universal media port based upon a DVI-I connector. This media port allows for extension of digital and analog media formats, including: DVI-D, HDMI, DVI-A, RGBHV or YPbPr signals. Embedded digital audio and unbalanced analog audio are both supported. The MPX system serves as a video splitter and an extender by wirelessly delivering audio and video to multiple displays up to 90M (300 feet) away. All MPX extenders feature an on-board web server for ease of central management. For system control and configuration, the Emerge MPX extender solution is accessible through an on-board web server that allows browser-based configuration, status monitoring, and administration. The extenders allow for centralized control of attached audio-visual equipment through RS-232 serial and infrared interfaces. 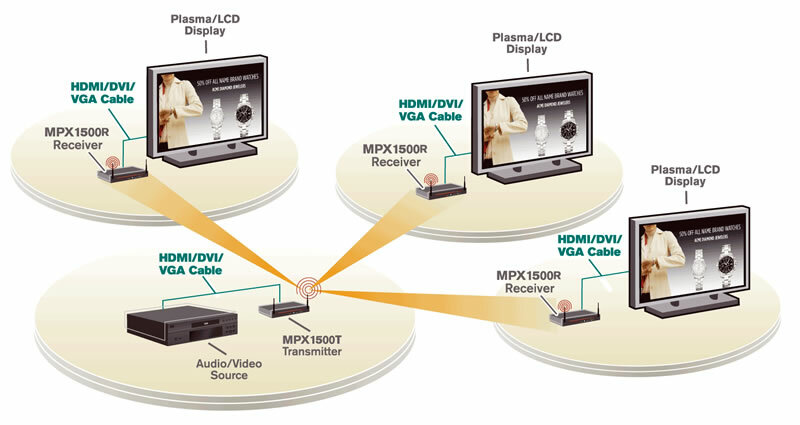 Point to Multipoint Distribution - Highdefinition computer graphics or video and associated audio can be distributed to as many as eight display devices. AES 128 Bit Encryption - Audio-visual nformation is encrypted with built-in Advanced Encryption Standard (AES) for secure transmission. Small Form Factor - Smaller profile allows convenient installaion and saves space where it's needed the most.